For centuries there have been signs and superstitions about love, causing plenty of enchanting ideas surrounding Valentine's Day. Here is a collection of most popular St. Valentine's Day superstitions and beliefs. These are mainly linked to singles, who believe that certain activities or things will bring them luck for that particular year and shower them with good luck to meet their perfect match for life time. 1By tradition, a young girl was supposed to eventually marry the first eligible male she met on Valentine's Day. 2To be awoken by a kiss on Valentine's Day is considered lucky. 3Some may believe that birds have nothing to do with romance, but in fact, legend has it that if a woman spots a winged creature on February 14, it will predict the type of man she will marry. 4According to superstitions, if on that day the girl saw Robin, she would get married to a sailor or crime fighter. It is much better if she catches Robin. 5If on that day a girl saw Dove, she would get married to a man with a golden heart. She will have a happy, peaceful marriage. 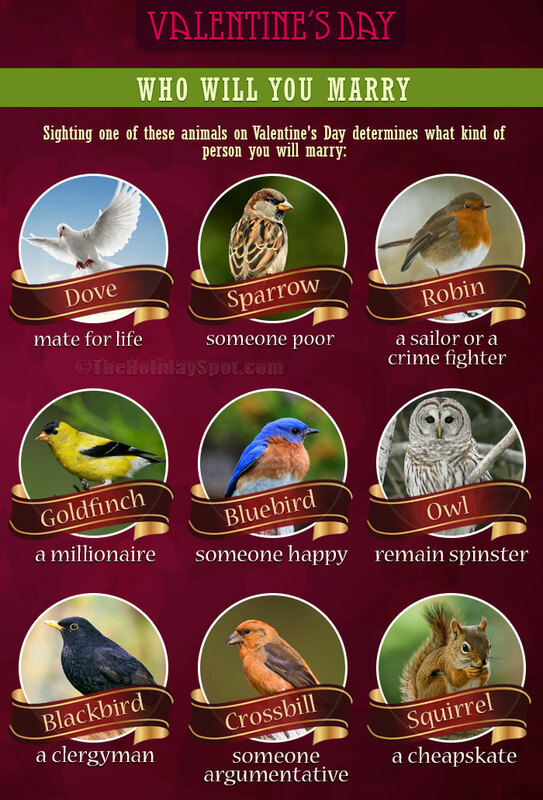 6If a girl saw Sparrow, she will marry with a poor man who will bring lots of happiness in marriage and life. 7On the 14th February if a girl saw Owl, because she will never get married. It is not good for girls. 8If a girl saw a goldfinch, she would marry with a rich man. 9If an individual thinks of five or six names considered to be suitable marriage partners and twists the stem of an apple while the names are being recited, then it is believed the eventual spouse will be the one whose name was recited at the moment the stem broke. 10The son of Venus arouses feelings of love with his Magical Arrows. Today, Cupid’s image covers cards, candy boxes and more. 11In the Fourteenth Century, a sweetheart was chosen for the day by lot. Messages sent between these randomly chosen pairs are believed by some sources to be the forerunner of the modern day Valentine card. 12The traditional gift of red roses can be attributed to Venus. The Roman goddess of love and beauty preferred roses. 13If someone receives red roses from her boyfriend, on the Valentines Day, he loves her. 14If someone receives yellow roses from her boyfriend, he is jealous. 15If a girl receives a cactus plant from her boyfriend, she will may have a quarrel, according to superstitions. 16If you see a squirrel on Valentine's Day, you will marry a cheapskate who will hoard all your money. 17In some countries, a young woman may receive a gift of clothing from a prospective suitor. If the gift is kept, then it means she has accepted his proposal of marriage. 18If you find a glove on the road on Valentine's Day, your future beloved will have the other missing glove. 19If an apple is cut in half, the number of seeds found inside the fruit will indicate the number of children that individual will have. 20 In Wales, wooden love spoons would be carved and given as gifts. Favored decorations for the spoons were hearts, keys and keyholes...the decorations meaning "You unlock my heart!"